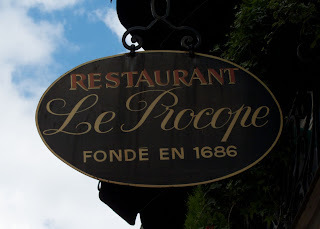 One of the restaurants that my husband and I tried while on our vacation was Le Procope. 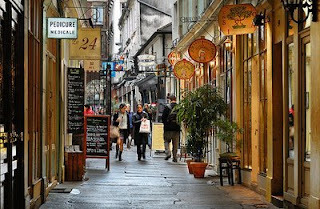 It is located in the St. Germain/Latin Quarter which is the 6th arrondissement, near the Sorbonne. We have often passed this restaurant on previous trips but had never dined there. But since one of our goals for this latest trip was to try new places instead of always going to our tried and trued favorites, we planned this outing. There are two entrances to this historical restaurant. The main entrance on the rue de l’Ancienne–Comedie and a “back” entrance that is part of a lovely passage called Le Passage de Cour de Commerce Saint-Andre. There are many passages still remaining in Paris [note, I am going to do a separate post on some of the ones we visited and will link to it when I do]. They are covered shopping areas that allowed the wealthy to shop unencumbered by the elements. Architecturally they are fantastic to visit and photograph, some have endured better than others. This passage was opened in 1735 and was built on part of the old wall of Paris, around the time of the King of France, Philippe Auguste. This wall made up the limit of Paris during the Middle Ages! The entrance to this passage is at 128 Blvd St. Germain. No matter what door you enter, Le Procope is a great restaurant to experience a traditional (and yes, heavy) French meal. The menu has all the classics: coq au vin (chicken in wine sauce), entrecote (steak), magret de canard (duck breast); beouf tartare, as well as several fish selections. The starters are equally traditional with terrines, salades, and escargot (snail), among others. The food is good. My escargot were a bit overdone, but the rest of the meal was very good. My husband had rognon (sheep kidney) and I had the duck. Dessert was divine, as I am a chocolate lover I chose a wonderful chocolate sorbet which was actually ignored because it was served with a dark chocolate macaroon with pistachio filling that was heavenly! The entire restaurant has been kept to its original furnishings when it opened in 1686. The restaurant served as a favorite spot of many famous philosophers, historians, and professors such as Voltaire, Robespierre, even Benjamin Franklin, gentlemen who studied or lectured at the universities nearby. In fact, there was once tunnels to allow these famous fellows to go between the university and the restaurant unperturbed. It is fun to imagine the conversations that took place within these walls! 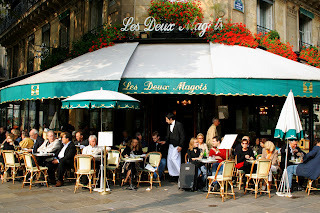 By the way, if you are spending the day in this area, start off with a light breakfast at Les Deux Magots which has a lovely terrace. It is a little over-priced because you are paying for the fact that you are sitting where writers such as Ernest Hemingway and Jean-Paul Sartre (with his muse, Simone de Beauvoir) as well as many others spent many hour writing within the walls, tables, and terraces of this wonderful cafe. How exciting to see Le Procope on your blog! I ate there with my husband a few years back. Absolutely fascinating establishment. I had the coq au vin and he had the magret de canard. Delicious and such a charming atmosphere. It was our one real dinner during our too-short trip to Paris but it certainly didn't disappoint! 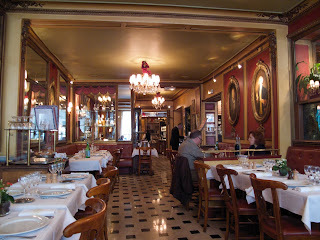 Andi, I ate at Le Procope on my first trip to Paris–it was near our hotel on rue St.-Andre-des-Artes!! What fun to see your post–it brought back a wonderful memory. ps. Send me your address so I can send you your Paris Shopping List Giveaway gift! I’ve been to Paris a couple of times, and have never paid attention to it’s food history! I guess now that I’m older, it is more important to me. Because I find myself looking for substance in the restaurants I go to here. Great pictures! Makes me yearn to return really soon! YUM. this sure makes me want to go there. you can find the best food in paris. i’ll remember this!